The Blue Frog looked at his reflection in the water and asked, "Why am I blue?" The Green Frog didn't know. Being different from one's peers can be hard. We all want to be part of a group and to be accepted and loved by others. We might struggle with whether to embrace our differences or hide them in order to fit in. 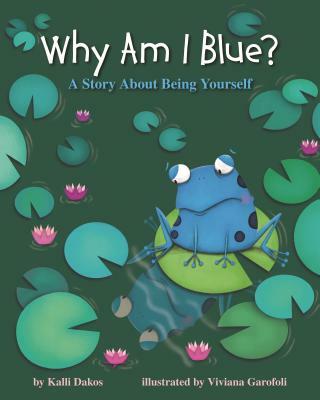 In this story, the Blue Frog wonders why he is blue, and not green like other frogs. He feels confused, sad, and different, and seeks to answer the question "why am I blue?" Eventually hearing a simple, but profound explanation, the Blue Frog begins to embrace his blueness and accept being different than his friends. Includes a Note to Parents and Caregivers by Gayle E. Pitman, PhD, that discusses how children experience differences throughout childhood and how adults can guide children toward an understanding and acceptance of differences and similarities they will face throughout life. Some differences can be a source of positive self-esteem for children. They could have qualities that are cool, quirky, and respected by others. For example, if a child is especially talented at something, like art, music, or athletics, they might feel respected by their peers, even though their talent sets them apart to some extent. Moreover, if this quality is nurtured by family members and teachers and through extracurricular activities, these differences can enhance self-esteem in a powerful way.